Tennis twice (or more) a day, swimming and ping-pong every day, lots of good walks, and more Vitamin D sunshine than a person deserves. We’re in paradise. Really! We were chilling out for a few minutes this evening, watching the end of a great sunset, and thinking aloud, “we’ll get used to this level of physical activity in another week”. We are in Mesa, one of a dozen or so “towns” in Phoenix, AZ. Friends Bob and Faith dragged us down here, carefully warning us it might be noisy, polluted, crowded, and hot or cold. And, they have been coming here six or seven years because they like it so much. They clearly were trying to undersell so we would not have our expectations set too high. Okay, we’ve got to try this for ourselves. The southwest has been enigmatic for us, something we hear about and read about but never experience. Taliesen West (the Frank Lloyd Wright place), Tempe, Scottsdale, Glendale, Mesa, and many more names and places have twinkled out there for us. Until now. We’re here and don’t notice the noisy, polluted, crowded, or cold. Well, the grocery store this morning was pretty dangerous with little old ladies on electric shopping carts pushing “go” instead of “stop”. And it is definitely on the hot side. But we’re not counting these things, we so many blessings. No problems with our level of expectations, this place is pretty great. Today, for example, Jim hit tennis balls against a ball machine an hour, we had breakfast, he played one and one-half hours mixed doubles tennis, we picked up some groceries, had a snack lunch, and walked the short distance to the pools complex. We played in the pool’s cool water a little while, read awhile, played ping-pong, swam laps, sunbathed under cloudy skies, showered and walked home. Have a drink, listen to a little music, watch the sunset and WHOA! Look at that sunrise, aren’t the clouds beautiful and the tall palms swaying very gently as the wind kisses through them? 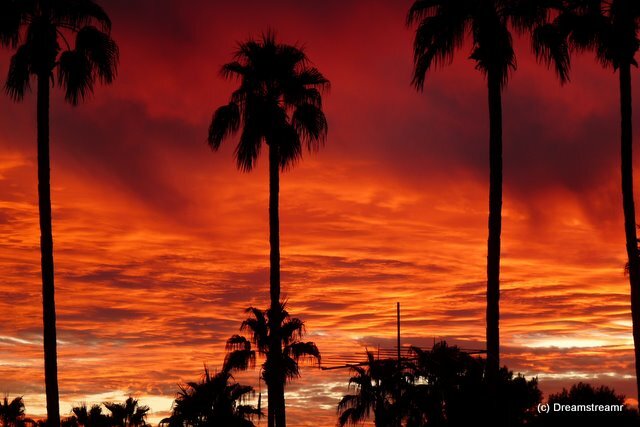 This is our first outstanding Mesa sunset, and we’ll appreciate additional ones if they are anywhere near this. We don’t need to go anywhere, we’ve done plenty today, but Debbie wants to practice hitting the tennis ball. We walk the short distance to the tennis complex, turn on the court lights, find a bucket of practice balls. Jim tells Debbie where to start dropping balls and hitting them against the fence. Then she practices her forehand and backhand swings toward the net and hits Jim several times as he tosses her balls to hit. This is great stuff! Back to our home and we watch the temperature drop, two hours after sunset, to 80F degrees from 92F earlier. Debbie fixed us a wonderful dinner of barbecue from Glenn’s in Kannapolis, NC (with Glenn’s bbq sauce, not Texas-style). Darn, this is the end of our North Carolina BBQ and we won’t be home for five or six weeks yet to reload. Oh well, worse things have happened. But not in Paradise! Yeah, it’s a little warm and pretty dry. We aren’t spending much on electricity because the heat doesn’t really feel bad if we are in the 5-10mph breezes outside our home. We see 75 degrees twice a day, briefly, and see a whole lot more hotter than cooler. The resort has a wonderful tennis complex with two or three illuminated courts, a huge practice board, ball machines, shaded grandstand, and teaching programs for all levels players. Jim has readily gained acceptance in the tennis crowd. They have recruited him to play number 1 doubles. The first match, against a neighboring resort, is Monday (hopefully they still like him after the match). Debbie has her first lesson Friday and will be playing as frequently very soon. We’re going on a 5 mile hike Saturday with another couple, both tennis players too. We want to visit the Ham Radio Outlet (HRO) store in Phoenix, Taliesen West, and Arizona State University, and check out the dancing lessons in the resort and locally, just for starters. We’re going to do all this in just two months, somehow. And, we sense, we’ll be back to Mesa again. We think we can stand this and more.